Every function is unique, thus Major Soundz quote on a case-by-case basis so you pay for what you require. We offer all of our clients a free personal consultation; we listen to your requirements and guide you to achieve the desired vision. We can provide the music for parts of your day or its entirety. We can create a custom package that includes DJ, sound and lighting. Our equipment is top of the line in terms of performance and aesthetics. 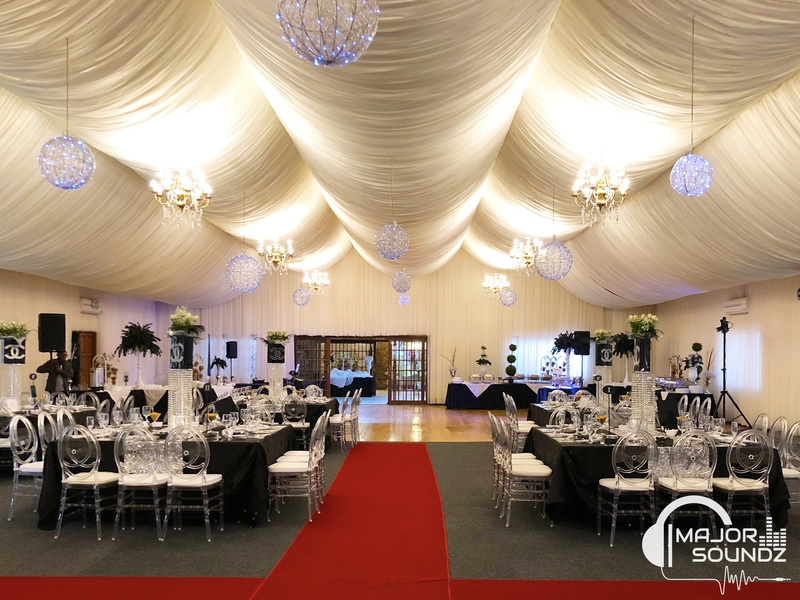 The set up will be complete before your function starts and everything can be provided by us. Our DJ is always presented in professional attire to match your level of sophistication and event. We are happy to share our experience by assisting with your programme coordination for your function, pre-recorded speeches, music editing for intros/themes. We collaborate with you to create a unique playlist that reflects the music desired, the guest’s preference and the nature of the event. We will mix the playlist live while adjusting to the energy of the crowd. You relax, have fun and dance the night away. We take great pride in what we do, this is our passion, we will ensure your party is remembered for all the right reasons. Don’t settle, invest in a DJ that is recommended, Music is the life to any party, Get A Quote now.